Juki MCS 1500 Cover Stitch and Chain Stitch Machine $649.00 - FREE SHIPPING! For professional results when sewing apparel and decorative items, having a sewing machine that can both cover stitch and chain stitch will definitely give you more options when it comes to your creative projects. You can find such a machine with the Juki MCS 1500! The Juki MCS 1500 is a great machine capable of both cover stitch and chain stitch in one machine at a great affordable price. 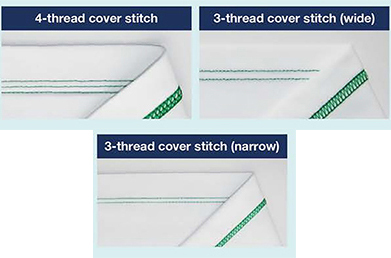 It features 4-thread, 3-thread (wide), and 3-thread (narrow) cover stitches which are great for hems, necklines, cuffs of sleeves, and more. The stitches also stretch, meaning you can use this machine for stretchable fabrics. The chain stitch is great for decorative stitching, but also serves a purpose – because it is quite strong, it’s great for waistbands and the side seams of pants as well. 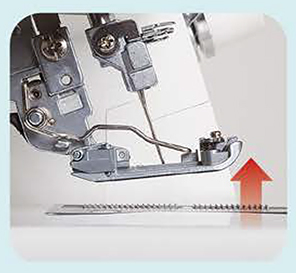 The presser foot on the Janome MCS 1500 can be lifted easily at an upward angle to make it easier for you to slip the fabric underneath. The pressure of the presser foot is also adjustable based on the fabric you are working with. The extension plate has guide lines to make it easier for you to manage your seams, while the presser foot also comes with a guide to use. 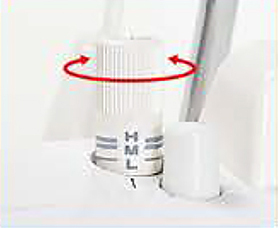 There is an external thread cutter as well to make things even easier for you. 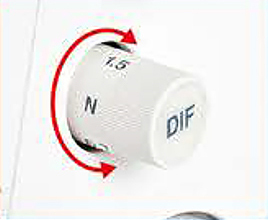 The differential feed is adjustable with a single dial to make it easier to sew different fabrics. The Juki Company warranty on the Janome MCS 1500 is 2 years for electrical parts, 5 years for mechanical parts exclusive of consumables parts, and a 90 day labor period to allow for adjustments by the vendor. The Juki MCS 1500 - It Sews Like A Dream! Cover stitch. 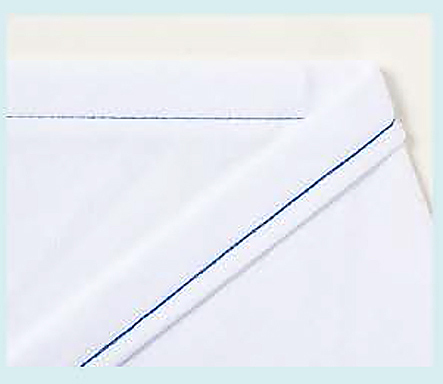 Perfect for various applications such as simple hems, sleeve cuffs and necklines. Since the stitching stretches, it's ideal for stretch fabrics. Chain stitch. Since the lower thread forms a chain on the wrong side of the fabric, the stitch is strong when it's stretched making it ideal for stitching the waist and side seams of pants. It also does well as decorative stitching for necklines. Adjustable differential feed. Adjust the differential feed to sew beautiful finishes, even with stretch fabrics such as knits and georgette. Simple looper threading. 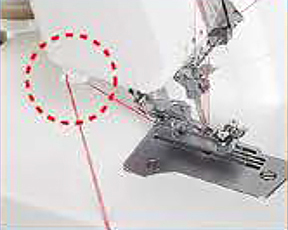 The looper can easily be threaded since it can be lowered at the press of a button. Extension plate with seam guide lines. 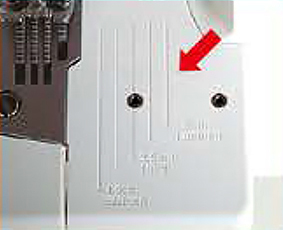 The seam guide lines on the extension plate are a useful aid for sewing. Adjustable presser foot pressure. 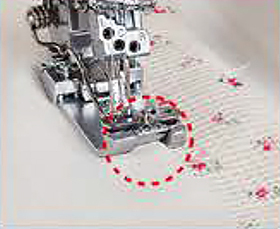 The presser foot pressure can be adjusted according to the type of fabric being sewn. Presser foot with guide. 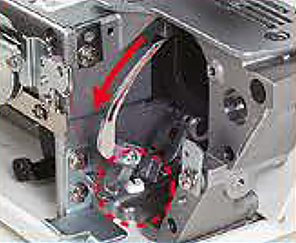 A presser foot equipped with a guide that presses down on both the left and right sides is provided as a standard accessory. Exterior thread cutter. The exterior thread cutter is useful when removing the fabric after raising the presser foot at the end of sewing. Juki Sergers have a 2 year electronic warranty on motors, light assembly, wiring, switches, circuit boards and speed control. A 5 year mechanical warranty is for "all other parts" however this excludes "consumable parts" such as loopers, feed dogs, knife blades, bulbs, lamps, presser feet, needles and belts. Juki sergers also comes with 90 days labor period on adjustments good through the Juki dealer the machine is originally purchased from. This warranty is valid only on products used for household purposes. Using this product in a commercial environment voids warranty. Super happy with my new Juki 1500CS. As with any machine there is a learning curve. Amazon is great. I had a little hick-up with the machine and Amazon did everything to make it right. Definitely a sturdy machine and would recommend to any body. Best purchase. I love this machine. The seller sent my item right away. I've had the Juki MCS-1500 for over 6 months and I'm very happy with it. It's pretty full proof. One negative reviewer complained about tunneling on a light weight knit, but there are ways to stabilize knits so this problem can be avoided. Tunneling on light fabrics is a common problem regardless of the make of machine. Another reviewer commented that the looper was very difficult to thread. I haven't found it difficult in the least. The directions in the manual are confusing, but once I watched the youtube video on threading the machine, it became clear as day. I'm very happy with the performance of the MCS-1500 and wouldn't hesitate to recommend it to any one searching for a good cover stitch machine. Great machine. Go ahead and get it. I love this awesome machine. This is my second Juki purchase as I already have a serger. They are great products that finish your items professionally. I am very pleased with this machine. This is my first coverstitch machine, and it has been very easy to set up and use. It works very well with spandex fabrics (unlike some of the lower end coverstitch machines that I have read reviews of). The motor is very fast and it feel like a well made instrument. Have not had any issues with it so far (few months of use).